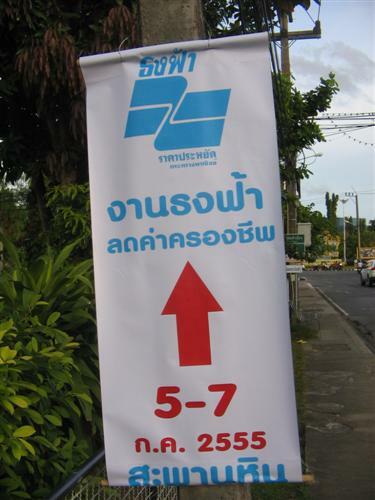 A sign promoting the DIT Blue Flag Fair at Saphan Hin Park in Phuket Town starting on Thursday. 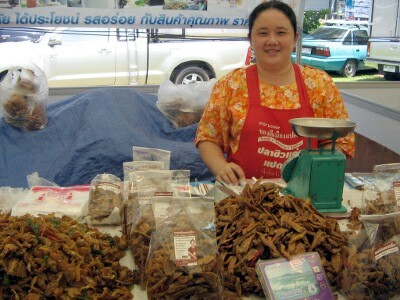 PHUKET: -- The Department of Internal Trade (DIT) office in Phuket Town will hold a “Blue Flag Fair” with cheap food and consumer goods at Saphan Hin on July 5-7. The event, to be held at the Central Staging Area at Saphan Hin Public Park, follows the success of the Blue Flag fair held at Sanamchai field, in the government office quarter of Phuket Town, in March. DIT-Phuket chief Supacha Bunthalit said the three-day event at Saphan Hin will be a “district-level” fair, smaller than the previous fair at Sanamchai, which had organizational support from the DIT headquarters in Bangkok. Thus the Saphan Hin event will comprise 80 booths selling consumer goods at below-market prices, but there will be no opening ceremony, staged entertainment or government-subsidized consumer staples at the fair, she said. Consumers can get to the central stage area at Saphan Hin by public transport using the Poh Thong Pink Bus service, Route 1. Cost: 10 baht.